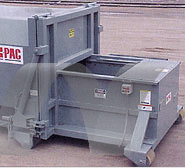 K-PAC’s KP1HT Self-Contained Compactor is an excellent choice where vehicle maneuvering space is limited, including chute or dock fed applications. By building the compactor onto the door where compacted solid waste material is emptied, time is saved by eliminating the extra maneuver required to turn conventional roll-off compactors. The hydraulic tailgate facilitates dumping of the compacted refuse at the landfill or collection site. One piece construction between packer head and container and a 44″ liquid retention height assure leak proof performance. 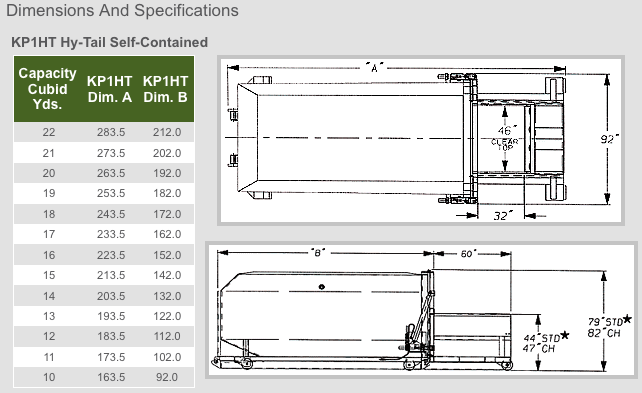 The KP1HT’s 1 cubic yard loading chamber, with a generous 32″ x 46″ clear top opening and 44″height, loads easily from chute, dock or ground level. A higher ram face pressure and deeper (13″) ram penetration give the KP1HT the best compaction performance in it’s class. KP1HT’s feature a heavy-duty dual ratchet latch system which pulls the door tightly and evenly against the door seal. K-PAC’s innovative latching system features an adjustable stop to prevent over compression of the door seal… resulting in longer seal life and less downtime for seal replacement. The KP1HT utilizes a full neoprene door seal to assure liquid retention. The KP1HT features a high-lift container door for complete emptying of compacted materials.